Alf Goodman and Godfrey Whitmore don’t know each other yet, but they are both hearing voices. Strange forces are at work to bring them dramatically together to reveal Alf’s simple tax plan that has someone in a position of power very worried. Alf is on the edge when GOD gives him the WORD, lecturing him about his obsession with taxation, insurance and his frustrated attempts to change the system. Suddenly Alf is blown off. Godfrey Whitmore falls under the spell of Lola Hope and is initiated into the inner sanctum. He learns how to really play the game in the halls of parliament. 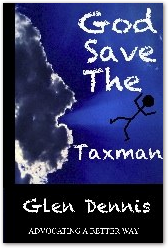 Alf has a hard time with life and business until Godfrey and Lola join forces with Alf and Doris Goodman, and millions of others, in an attempt stop “The War”. 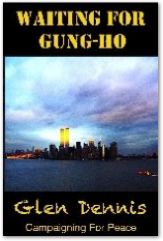 WAITING FOR GUNG-HO will be available soon from Smashwords Inc.
After their failure to stop “The War”, Alf & Doris and Godfrey & Lola take more traditional steps to save the world. They explore scientific and theological theories to explain what is happening to their universe. Alf feels the effects of psychological warfare and FEAR sets in. Is he under attack from an unseen foe via the Internet? Or is it even more sinister? Despite a veiled threat from Lola’s boss (The Minister), Godfrey decides to fight him at the polls, with encouragement and support from Alf. 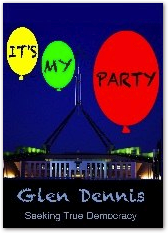 IT’S MY PARTY will be available soon from Smashwords Inc.